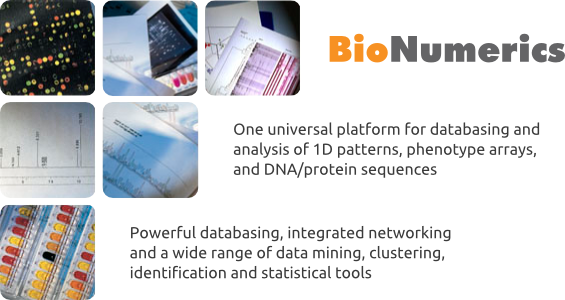 BioNumerics is the only software platform that offers integrated analysis of all major applications in Bioinformatics: 1D electrophoresis gels, all kinds of chromatographic and spectrometric profiles, phenotype characters, microarrays, and sequences. The unique power of BioNumerics lies in its ability to combine information from various genomic and phenotypic sources into one global database and conduct conclusive analyses. 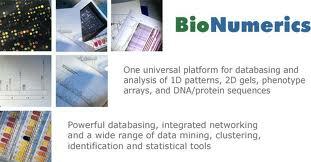 BioNumerics runs on industry leading database engines such as Oracle® and Microsoft® SQL Server™. With its integrated networking and client-server features, the software is the perfect backbone for universal data management and analysis within and between laboratories of any size. A large number of free plugins available for specialist applications, automation, advanced analysis tools, reporting, etc.